2:33 now the cup and handle buffs are yelling "Buy the handle." 2:11 here we go -stop to 60; just under the 110 -note the "curl"
10:06 Crazy Harry is the conductor of the S&P train, know amongst hobos as The Stop and Pee. He likes to fake pulling out of a station to get the hobos to jump on, then back up so he can go catch them. 7/13/2007 12:45:49 PM Mountain TG:: Al, nice call re: 2:30 short covering. A nice little hanging man candlestick right at 2:30. I guess that was the shorts getting hung. 7/13/2007 12:15:41 PM Mountain TG:: Yup. I like to wait for a definitive move 4 to be made and then some juice before I get involved. Then I have probably too much patience but I built that into my system on purpose (you have to let a 2 year old act like a 2 year old). Anyway, let's just say that today, the very minimum for a move 3 up, move 4 down and juice were met. But here we go, that's looking good now. 7/13/2007 11:38:42 AM Mountain TG:: Also long from 60.5. 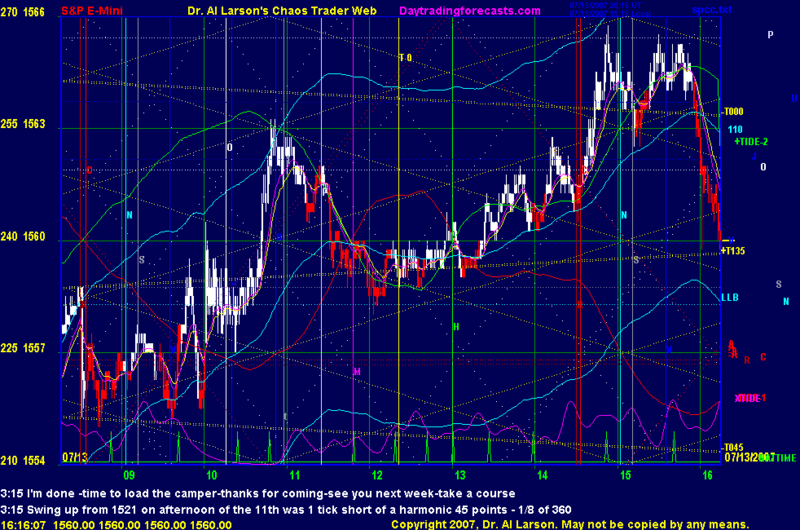 I think we just started move 5 of daily fractal, maybe move 7 of 3 day fractal. Tough one to read though. 7/13/2007 9:33:53 AM Mountain Ben:: So much for that analysis :( Heading south instead. 7/13/2007 6:52:15 AM Mountain jrg:: Greetings Al from HK, China. Hope you are doing well!